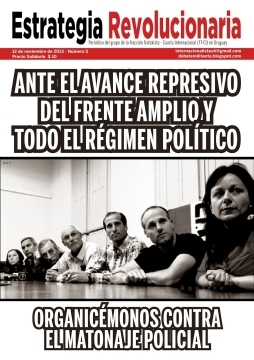 25.02.2015 The political crisis which has unfolded after the death of special prosecutor Alberto Nisman is, without a doubt, one of the greatest obstacles faced by the Kirchner government in over a decade. 21.09.2014 Help us promote this campaign to raise funds for the more than 60 families laid-off by Lear Corp in Argentina. The struggle for their reinstatement has being going on for more than 100 days! They need your support. 16.08.2014 We must coordinate our struggles to fight back against the bosses that attempt to unload this crisis on the backs of workers with dismissals, furloughs, or factory closures. A clear example of this is the vulture American multinational Lear, which together with the SMATA union, ordered furloughs, and later, massive layoffs but was resisted by the workers and the shop stewards committee. The leadership of SMATA now brutally attacks the shop stewards who were elected by 70% of the workers. 14.08.2014 Buenos Aires: Another multinational company from USA has left hundreds of people jobless in Argentina. RR Donnelley, headquartered in Chicago, IL has declared bankruptcy and closed its factory doors leaving over 400 families without work. The closure has been deemed illegal. Workers have set up roadblocks on Panamericana Highway, not far from Lear protests that are still ongoing. Donnelley workers occupied the factory yesterday, August 12th and put it into production. 12.08.2014 Garín district, Buenos Aires, 12/8/14). Trade union delegate Jorge Medina said: “after closing its plant in the Garín district of Buenos Aires Province, Argentina, in a totally illegal fashion, leaving more than 400 families on the street, and that the Ministry of Labour confirmed that the company is breaching the ruling of the court that ordered both sides to have (compulsory) arbitration to resolve the labour dispute, the shop stewards’ committee and workers at R.R. Donnelley have resolved in an assembly to occupy the factory and begin production, in order to defend the 400 jobs. The workers denounce this closure as illegal and we are not going to be intimidated. We demand the immediate re-opening of the plant under the same working conditions, number of workers and salaries. If the company alleges that it is in bankruptcy we will begin production. 12.08.2014 The shop stewards’ committee and workers at R.R. 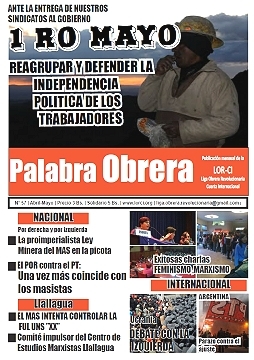 Donnelley have denounced the American multinational printing company – a leading player in the sector with printing operations in Asia, Europe, Latin America and Canada – for closing its plant in the Garín district of Buenos Aires Province, Argentina, in a totally illegal fashion, leaving more than 400 families on the street. We demand the immediate re-opening of the plant. 14.07.2014 In a packed public lecture, held at the National Congress, where Mothers of Plaza de Mayo, provincial deputies, and dozens of supportive social organizations participated, Lear workers announced today a plan to fight for the reinstatement of 100 dismissed workers, 100 laid off workers, and for the reinstatement of the Internal Committee to the American automotive-parts manufacturer located at the town of General Pacheco (Buenos Aires suburbs). 04.07.2014 Given the increasing gathering of workers and students, the Provincial Police forces have withdrawn their hundreds of units which were intended to evict the picket lines at the gates of the car manufacturing corporation LEAR. But the order of the Judge Ricardo Costa and attorney Molina Pico are still firm, which allows to think of further repressive attempts. 03.07.2014 Despite the Argentine government’s announcement that they are reactivating a line of credit to the automotive industry, last Friday saw massive firings at the auto parts manufacturer Lear, in Pacheco. Meanwhile, a third of the plant’s workers were laid off, with the additional problem that for a period of 30 days starting last week, the laid-off workers will not receive any type of remuneration. 15.06.2014 Only days after the opening of the Soccer World Cup, the president of Brazil, Dilma Rousseff, had to come out on national media outlets to silence critics of the multi-million dollar expenses for the mega-event. 03.06.2014 Agustin Comas, Gestamp worker’s lawyer, informed the press that today, Monday, June 2nd, ended the first hearing on the compulsory conciliation at the delegation of Campana, Ministry of Labor. 03.06.2014 Roberto Amador, Gestamp reinstated worker, stated from the building’s door, “ the company’s managers told us today that there is no production because supposedly they are inspecting the facilities..."
01.06.2014 Left and Workers’ Front provincial MP Christian Castillo today rejected the ‘outrageous’ statement made by the Minister of Production, Debora Georgi, whom he said “had gone too far in her servility towards the bosses and the trade union bureaucracy by rejecting the arbitration process announced at the Gestamp plant by the Minister of Labour of Buenos Aires Province”. 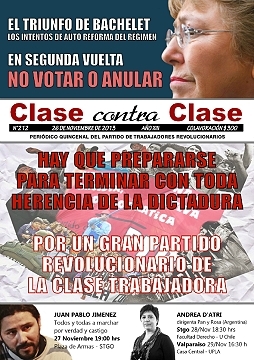 Argentina: Gestamp worker Roberto Amador stated, “We have achieved a great triumph..."
25.05.2014 A big step against the cuts of the bosses and the government and against the attacks of the unions bureacracy. Dozens of delegations of industrial workers, teachers and public servants participated. Kraft foods, Pepsico, Volkswagen, Stani, Donelley, Printpack, Gestamp and Siderar, workers were among the delegations. "Marx Is Back", a mini-series of fiction based on the Communist Manifesto! 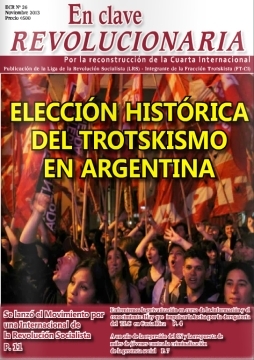 22.05.2014 "Marx Is Back" takes place in todays' Argentina, which suffers like other countries the blows of economic crises. Workers of a printing house are facing suspensions and lay-offs; a group of workers are organizing to fight back as the union officials try to push them aside. At the same time, Martin, part of the workers' group, starts to read the Communist Manifesto and ends up meeting Karl Marx himself, is he dreaming or is it reality ? 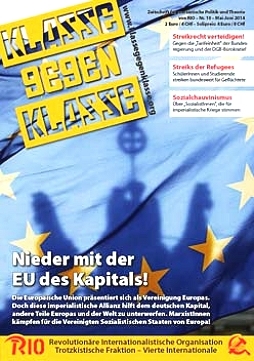 All through the episodes Marx appears in the story, exposing his revolutionary ideas regarding social classes, the crises, the State and communism.